A story published by The Washington Post Friday claims Russia hacked the electrical grid in Vermont. This caused hysteria on social media but has been denied by a spokesman for a Vermont utility company. The Post published the story before being able to get comment from the two utility companies in Vermont. The Burlington Electric Department would end up putting out a statement showing the premise of The Washington Post story as being untrue. 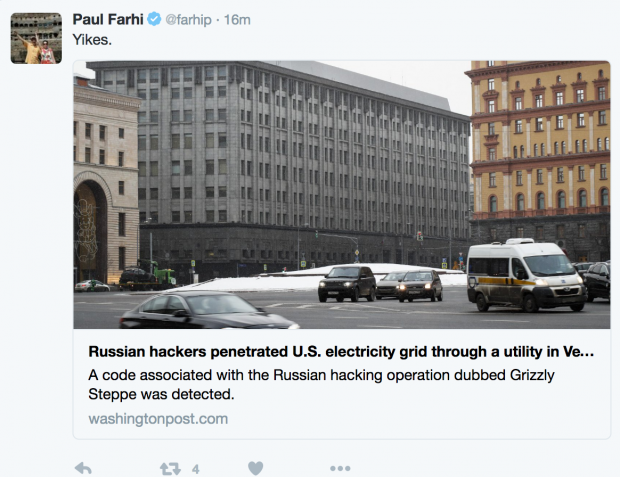 However, this false Washington Post story about a Russian intrusion into the American electrical grid has caused panic among journalists. The Post has since updated the story. The headline changed to “Russian operation hacked a Vermont utility, showing risk to U.S. electrical grid security, officials say.” The updated story said the “code entered the Vermont utility’s computers,” but the utility spokesman’s statement stated the code was found on one laptop.